Think about some of the unhappiest moments you have experienced, and you'll realize that they all have one major element in common. You felt powerless. When I was young, I'd sometimes lose my temper. You lose your temper when you feel frustrated, when you don't feel that you have control over your life. I wish I could tell you that in terms of controlling my emotions, I was always my father's son. But it took me a long time to control my temper. When we are unhappy, it's because we feel we don't have control over our lives. Physically that's often true, but when we remind ourselves that spiritually we are always in control unless we give it away, then happiness is ours. As I said, it took me a long time to learn that. When I was a senior in college, I had a chance to take an elective course. I thought I'd take one in ornithology; that sounded rather interesting. I learned something the first day: that it's the study of birds. I didn't know that. It was a large class, a lecture hall of about 800 people. The man teaching this course was a good teacher, and he warned us that on the final exam we'd have to identify birds. Well that seemed fair; after all it was a course in ornithology. But when we got the test, all it was was 28 pages of pictures of birds' feet. Twenty-eight pages! After the test, I went to his office to complain. I was the ninth guy in line. By the time I got in there, you could tell he'd already heard enough. He said to me, "I don't know who you are. I don't care. But if you're here to complain about that test, save it. It's a fair test. I've given it many years, and if I hear one negative word out of your mouth, I'm writing down your name and I'm reporting you to the dean." I said, "Well, sir, it was a great course, very interesting, very informative, but I did think the test was a bit unusual." He said, "I'm warning you, not another word." Then suddenly I felt out of control. I could feel my emotions using me rather than me using them. I said to him, "Fine, you want to hear the truth? That's the most stupid test I've ever taken. I don't know how a grown adult had the nerve to give that to a group of college students. If I were you, I'd be ashamed of myself." He said, "That did it. Man, that did it. What's your name?" So I held up my foot, and I said to him, "You tell me." To repeat, unhappiness is most often based on the feeling that you have no control over your life. Ready to LEARN to follow through on promises made to yourself and others? When you think about promises you make to yourself in life to achieve certain things, such as, "I promise to have more control over my emotions," ask yourself, "Who's my audience, and are they worthy of my promise?" Shakespeare once said, "All the world's a stage, and all the men and women merely players." Actually there was a story of an actor who was doing Shakespeare, and he wasn't doing a very good job. After a point, the audience, who had been quite patient with his lack of talent, finally started booing him. And the actor walked to the very edge of the stage and said, "Hey, why take it out on me? I didn't write this garbage." Anyway, Shakespeare said, "All the world's a stage, and all the men and women merely players." He was right, of course. Even if we are not consciously aware of it, we are all performing for an audience. When we make a promise to ourselves, directly or indirectly, we are often doing so because of that audience. If, for instance, you make a promise to yourself to eat healthier and exercise, you are probably doing it not only to enhance the quality of your own life, but also to increase the probability that you'll be healthy enough to take care of those who depend on you. In this example, however, you are consciously aware of who your audience is. But maybe there are a few other people in your audience for whom you are unconsciously performing. Unconsciously, perhaps there's a small part of you who thinks that some day walking down the street you're going to meet your high school sweetheart. She'll be astounded by how young and handsome you look and will regret the day she dumped you. A few years ago I did actually run into my high school sweetheart, who told me I hadn't changed at all. So apparently I'm the only middle-aged man who looks like he's 18, or I was the only high school student who looked like a middle-aged man. Or you may still be listening to the voice of your mother telling the 10-year-old you to eat healthier. The problem is that many times we do not really think about who our real audience is. We do not look beyond the footlights to see the faces of the people we are truly and often unconsciously trying to please. We instinctively know that there's an audience out there, but we don't bother to consciously think about who they are, how they affect our behavior, why it's so important what they think of us, or how much power we give them over our lives. Some of us unconsciously perform for our co-workers, friends, or even the neighborhood kids whom we grew up with and have not seen since our childhood. We may be performing for parents who have been dead for years, or even a parent we've never met. Some of us even perform for an audience made up of people or even one person whom we despise. I know one fellow, for instance, whose wife divorced him when they were in their mid 20s. These two people really did not like each other. Yet he spent the next 20 years living a life totally designed to impress her, even though he never heard from her again. After you make a promise to yourself, take an honest look at the faces in the audience for whom you are performing. Then ask yourself some questions: "Is performing for this audience helping me achieve a happy, productive life? Is the interest of some of the members of this audience in my life, in my performance, in the promise that I have made more a figment of my imagination than reality? Do these people care about what I'm doing? I mean, really care? Do they even know what I'm doing? Are there people in my life who are presently not in my audience but who deserve to be more than those who are there now? Am I the kind of person, for instance, who consistently behaves in ways to please my friends at the expense of my children? Do I usually choose a day of golf with my friends rather than a day at the park with my kids? Ideally, isn't the most important member of my audience the one who should always be sitting in the center seat? Shouldn't that person be me?" When you realize who should really be the faces in the front row, the promises you make to yourself and to them become more worthy or vital, and you become more determined to achieve them. The fourth question you should ask yourself is, "Does my promise reflect what I want rather than what other people think I should want?" This is a very difficult thing to do if you do not unconditionally love yourself, and instead, depend on the conditional love of others, that is if you allow your actions to be dictated by emotional threats, virtually always unspoken, of those around you. Are people around you silently saying, "I'll love you if you behave the way I think you should behave"? We too often conduct our lives to please the collected whims and whines of those we care about. We voluntarily place their collar of how they think we should behave around our own necks and put the chain that attaches to it in their hands, even though we fully realize that we will never lead truly happy and productive lives unless we consciously do what we want. What we want to do, of course, is logically limited to what is legal and moral, and does not intentionally hurt anyone else. But the basic rule here is, the basic thinking is, never walk a road that doesn't lead to your heart. Why do we subordinate what we want to other people's wishes? Because we respect their judgments, insights, points of view, and opinions more than we do our own. We don't have enough self-respect, so we depend on the respect that others give us. We believe that people will respect us if we do what they want. In fact, just the opposite is true. In the long run, most people respect you more if you do what you think you should do. Think about it: Why hand over control of your self-respect to others? Is your focus on what other people think? I live across the street from a lake. A friend of mine suggested that we both buy hydrobikes, which, instead of having wheels, are supported by two pontoons. There's a propeller in the back. The bikes are very odd-looking things, but he said they'd be great exercise and also a lot of fun. He was right. Of course, people point and giggle at us, and when we get on the hydrobikes, it's worse. Self-respect is an incredibly important element in anyone's life. Why would you base it on other people's opinions of you? Self-respect must come from within, from you. There are a lot of silly things being said today about self-esteem, about self-respect. You hear the experts say that you should love yourself just because you're you. I don't think that's correct. You're here; you have talents, opportunities, intelligence, do something. I believe that true self-respect is based on your belief in your potential, a celebration of your achievements, and how you choose to great others. Since you control all of these areas, you're in control of and determine the strength of your self-respect. Your self-respect should not be based on how others view you or treat you. Although you may try to influence what other people think of you, ultimately you know that you cannot control it. It's foolish to hold yourself responsible for what you cannot control. You can demand that people treat you with respect, but that is very different from people actually respecting you. You can only influence that; you can't control it. Perhaps it's because we live in a democracy that we make the mistake. But the reality is the majority rules, not the majority's right. At one time, most people thought the world was flat, but that did not make it so. Virtually every great achievement championed by an individual was, in its initial stages, either condemned, dismissed, or laughed at by the majority. History, for example, has never recorded any conversation such as, "Gee, Mr. Edison, it sure gets dark at night. Do you think there's anything you could do about it?" Every day, in ways that we are not even aware of, we give power over our lives to other people. Often it's people we intensely dislike. Recently, at a small-town political gathering a woman commented to me, "I really dislike the mayor's assistant. He just infuriates me." He could only do that because she gave him the power to do it. Always remember, no person or place or thing or set of circumstances can make you happy or sad or anywhere in between unless you give it the power to do it. Again, you are always in charge of you. No one can pull your chain unless you put it in the person's hands. There are many times when quite logically you do care about the opinions of others. If you're in sales, you care about what your client thinks about your product or service. I care about your opinions of my writings and audio programs because I'm being paid to make them appealing to the people who are paying for them. A teacher cares about whether or not the student feels he or she is learning. Parents care about the opinions of their children. But all of this is quite different from advocating power over your personal choices, your decisions, and the promises you make to yourself, to the opinions of other people. Ready to commit to finishing strong and becoming more powerful? The foundation of every mind is attitude. And the mortar for a positive attitude is self-love. Love for others is based on this strong foundation. Without a strong foundation, your mind will be weak and will need to lean on the strength, the opinions of others. I've had the privilege of being on the Oprah Winfrey Show a couple of times. There's a woman with an incredibly strong positive attitude. You should make promises to yourself based on your desires, your judgments, your insights and knowledge, your beliefs. Such promises will ultimately benefit everyone around you because you'll be giving them the best of you. You should have a high opinion of yourself that is backed up by achievement and promises that will lead to even greater achievements. You should have a very high opinion of yourself and every day set out to prove it. The virtue of humility is greatly overrated. The meek may inherit the earth, but only after the confident get darn good and ready to let them have it. As my grandfather used to say, listen to everyone's opinion; take no one's advice. The fifth and final question you should ask about your promise is, "Does my promise reflect my beliefs that life is the art of balance?" Yes, life is the art of balance. You have to be sufficiently happy to enjoy today, while at the same time feel enough unhappiness or dissatisfaction that you want to create a different and better tomorrow. There must be a balance between conscious and unconscious choices. A balance among all the "me's" within you. You must be obsessed with living your life to its fullest, but moderate in any one way you choose to do it. Whatever it is, your job or a hobby or spending time with friends or family, at the time you are involved with it, you should be living totally in the moment. But when you make a promise to yourself, you must be moderate in how much space you give it in your life. Otherwise you may consciously succeed at keeping that promise at the expense of unconsciously abandoning other important areas of your life. We see examples of this every day among celebrities. The rest of us consider many of those people "successful" because they have fame and fortune. But many of them are not truly successful and therefore not happy, because their career achievements have come at the cost of failing in many other areas of their lives, their personal relationships, their health, their peace of mind. No balance. Obsession can be a very dangerous thing. A friend of mine is obsessive about golf, absolutely loves it. Last March he got up early one Saturday morning, kissed his wife goodbye, put on his golf clothes, walked down the stairs, got his golf clubs, and opened the front door. But unfortunately for my friend, he lives in the Midwest. This was a March morning; it was probably no more than 35 degrees; it was raining, sleeting, snowing. A 35-mile-an-hour wind was blowing everything sideways. He stood in that open doorway knowing what he had to do, but not looking forward to it. Finally he sighed, closed the door, put his golf clubs away, walked up the stairs, back into his bedroom, took off his golf clothes, climbed into bed behind his wife, and he said to her, "Man, oh, it is one horrible day out there." And she said, "Yeah, and would you believe my husband, the nut, is out there playing golf?" 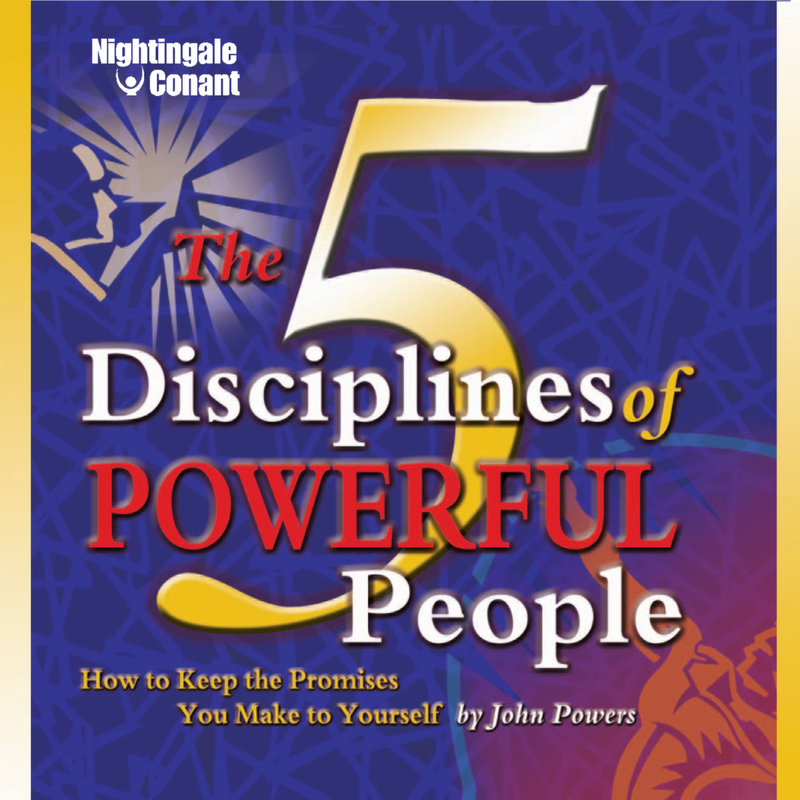 The 5 Disciplines of Powerful People at the special price below. — I can select one of two ways of ordering.